Throughout the year I enjoy my share of milkshakes, floats, sundaes, and other yummy ice cream creations. The hot summer weather just gives me an excuse to enjoy it even more! This summer I’m stocking my freezer with Blue Bunny ice cream. They have so many great flavors from classics like Vanilla and Chocolate to fun flavors like Bunny Tracks and Banana Split ice cream, and they have so many fun novelty ice creams! 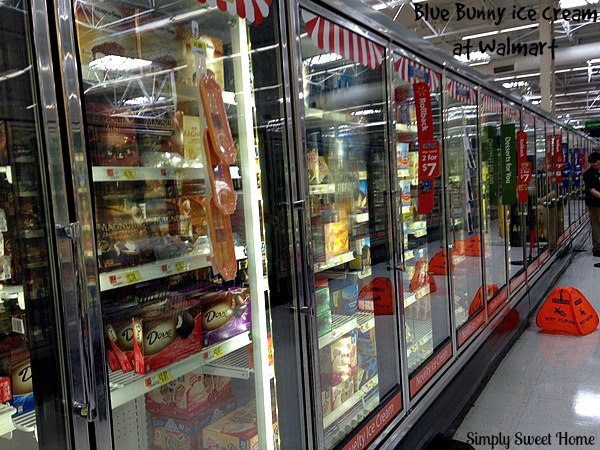 While browsing the ice cream freezer, I found the Blue Bunny Novelty Freezer! It was filled with yummy delights like Mini Cones, Ice Cream Sandwiches, Orange Dream Bars, and more! You can find these treats in the ice cream aisle at Walmart. 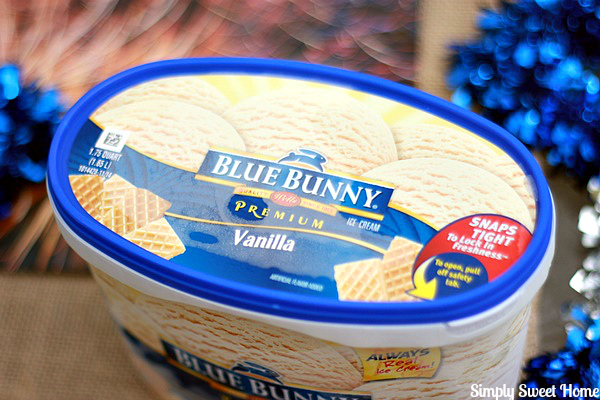 Look for the special freezer with the Blue Bunny Label! 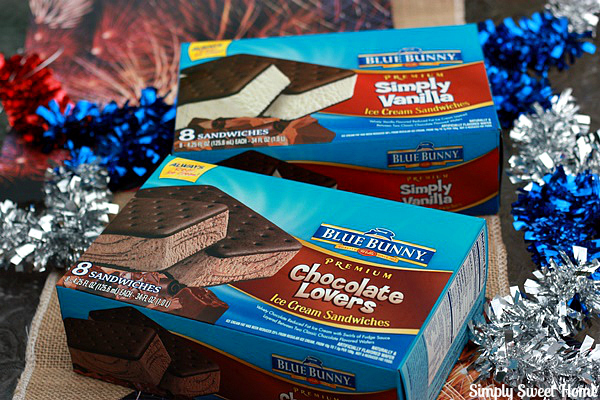 I picked up Blue Bunny Simply Vanilla Ice Cream Sandwiches and Chocolate Lovers Ice Cream Sandwiches! Ice cream sandwiches have always been one of my favorite treats, but for this shopping trip, I got the ice cream sandwiches for a specific purpose: to make an ice cream sandwich cake! 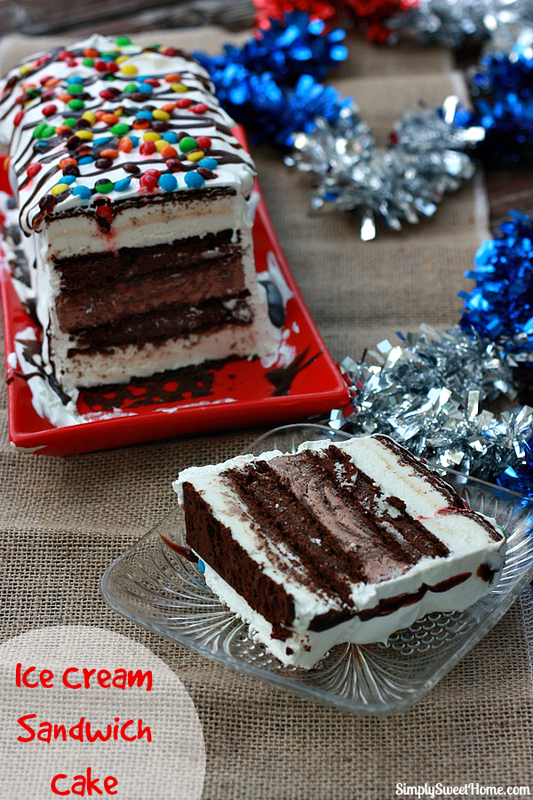 This ice cream sandwich cake can be constructed in just minutes! Then you just freeze until ready to serve. It’s a fairly versatile dessert because you can decorate with any toppings you’d like, from chocolate and caramel syrups to your favorite candies, and even fruits. And because it’s so easy, it’s great to make at home for your family to snack on or make as a take-along dessert for parties. Anything goes! Optional - candies and ice cream toppings to decorate the top. Combine fudge topping and 1 cup whipped topping in medium bowl until blended. Add dry pudding mix; stir for 1 minute or until fully combined and the mixture is slightly thick and creamy. Frost with one 8-ounce tub of whipped topping. Freeze as is, or decorate with your favorite ice cream toppings and candies. Freeze for at least 2-3 hours before cutting. Use a really good knife for cutting! What is your favorite ice cream flavor? Which Blue Bunny products would you like to stock up on this summer? Tell us in the comments section of this post! And check out the Suns Out Spoons Out site for other great recipe creation ideas! This is the perfect dessert for summer parties! I am loving how you decorated it! I think my kids would go crazy for this! What a pretty cake! It looks as good as the ones you buy at the ice cream store. That looks amazing! My kids would love it! 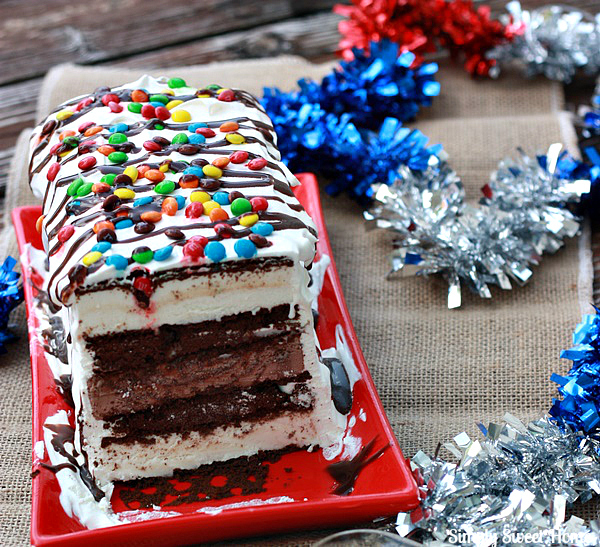 I love ice cream cakes and this is a fantastic way to make one up in a jif!!! So cute, too! That is so cute and looks really easy to make! So much fun and of course you’d have to eat it very quickly…wouldn’t want it to melt. Maybe I won’t even share. My favorite flavor is chocolate! I love the quart size offering and my kids love the ice cream sandwiches! Delicious creamy flavorful dessert! What an awesome recipe for the summer as well as easy. Thank you so much for sharing this. 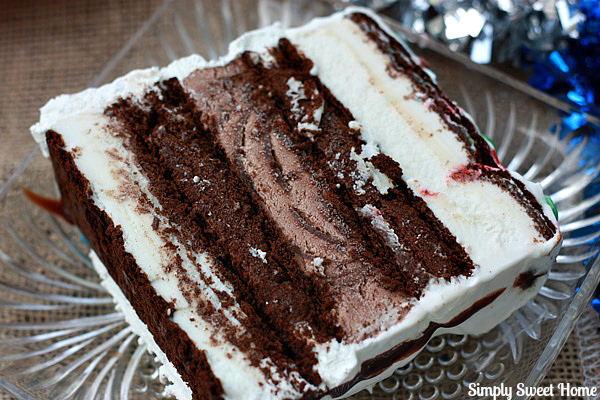 I love this ice cream cake you created with the sandwiches. Genius! Now I want to go buy ice cream sandwiches. How simple and how yummy! I will try this for my son. Okay I won’t lie: the grown-ups will love it too. Super YUMMY! My hubby will love this! Pinned! Hi Jerri! Gosh, I haven’t seen you for ages. I remember linking up to your party a couple years back. It’s so nice to see you here at my little part of the world. This recipe looks so, so good. Thank you so much for linking up to Thriving on Thursdays here in Australia. I’m featuring this one at tomorrow’s party. Hope to see you again. This looks amazing! We eat a lot of ice cream during the summer and this is an easy to make twist for an ice cream dessert. Thanks for sharing on Merry Monday. Pinned. This looks so fun. I am an ice cream sandwich addict. Thanks for posting. Hello from Foodie Friday.